Pro-Palestinian activists enter Gaza through Rafah crossing with $5m of aid for residents of Israeli-blockaded strip. Pro-Palestinian activists in more than 100 cars and trucks have crossed into the Israeli-blockaded Gaza Strip through Egypt’s Rafah crossing with aid worth nearly $5m. The multinational “Viva Palestina” ship arrived at Egypt’s port city of al-Arish from Lattakia, Syria, earlier on Thursday. About 300 activists then flew into al-Arish airport and converged with the ship’s passengers before entering Gaza. The activists had initially joined up in Syria from Turkey, Algeria, Morocco, Jordan, and more than two dozen other countries. The convoy, which was organised by George Galloway, a British politician, originally departed from London on September 18 and arrived in Syria two weeks later. The activists then waited for over two weeks in Lattakia for permission from the Egyptian authorities for the shipment, which includes medical supplies and school equipment, to be allowed to enter al-Arish port. The aid does not include any building materials, which the Egyptian authorities did not allow, as part of the agreement permitting the activists to enter Gaza for three days. Israel has kept Gaza under a blockade since 2007, saying it is a necessary step to stop arms reaching the Hamas group running the strip. Several dozen survivors from the Israeli attack on May 31 on the Turkish aid ship the Mavi Marmara were among those in the “Viva Palestina” convoy. Israeli commandos killed nine pro-Palestinian Turkish activists when they boarded the Mavi Marmara, the main vessel in a ‘Freedom Flotilla’ also attempting to deliver aid to Gaza. Israel’s leaders said their troops opened fire in self-defence after being set upon by activists. However, a UN inquiry last month found that Israeli troops broke international law by boarding the flotilla and found that the killings of activists on-board were comparable to “summary executions”. After an international outcry over the Mavi Marmara raid, Israel relaxed its embargo but construction materials remain restricted. Gazans have limited freedom of movement and Israel still enforces its naval blockade. – And envy as well. To get to the Top Ten. A place on The Ten. God – what an old trick! Dedicated to the memory of the Turks and of Farrakhan Dogan, Turkish-American citizen murdered by Israel, May 31st 2010. A major Jewish religious figure in Israel has likened non-Jews to donkeys and beasts of burden, saying the main reason for their very existence is to serve Jews. 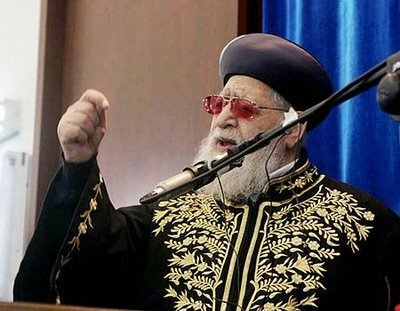 Yosef is considered a major religious leader in Israel who enjoys the allegiance of hundreds of thousands of followers. Yosef, also a former Chief Rabbi of Israel, was quoted by the right-wing newspaper, the Jerusalem Post, as saying that the basic function of a goy, a derogatory word for a gentile, was to serve Jews. “Non-Jews were born only to serve us. Without that, they have no place in the world-only to serve the People of Israel,” Yosef said in his weekly Saturday night sermon which was devoted to laws regarding actions non-Jews are permitted to perform on the Sabbath. Yosef, widely considered a prominent Torah sage and authority on the interpretation of Talmud, a basic Jewish scripture, held a comparison between animals of burden and non-Jews. “In Israel, death has no dominion over them…With gentiles, it will be like any person-They need to die, but God will give them longevity. Why? Imagine that one’s donkey would die, they’d lose their money. The concept of gentiles being infra-human beings or quasi-animals is well-established in Orthodox Judaism. For example, rabbis affiliated with the Chabad movement, a supremacist but influential Jewish sect, teach openly that at the spiritual level, non-Jews have the status of animals. Abraham Kook, the religious mentor of the settler movement, was quoted as saying that the difference between a Jew and a gentile was greater and deeper than the difference between humans and animals. Some of Kook’s manifestly racist ideas are taught in the Talmudic college, Merkaz H’arav, in Jerusalem. The college is named after Kook. In his book, Jewish History, Jewish Religion: The Weight of Three Thousand Years, the late Israeli writer and intellectual Israel Shahak argued that whenever Orthodox rabbis use the word “human,” they normally didn’t refer to all humans, but only to Jews, since non-Jews are not considered humans according to Halacha of Jewish law. A few years ago, a member of the Israeli Knesset, castigated Israeli soldiers for “treating human beings as if they were Arabs.” The Knesset member, Aryeh Eldad, was commenting on the evacuation by the Israeli army of a settler outpost in the West Bank. Faced with the negative effect of certain Biblical and Talmudic teachings on inter-religious relations, some Christian leaders in Europe have called on the Jewish religious establishment to reform the traditional Halacha perceptions of non-Jews. However, while the Reform and Conservative sects of Judaism, have related positively to such calls, most Orthodox Jews have totally rejected the calls, arguing that the Bible is God’s word which can’t be altered under any circumstances. The Bible says that non-Jews living under Jewish rule must serve as “water carriers and wood hewers” for the master race.